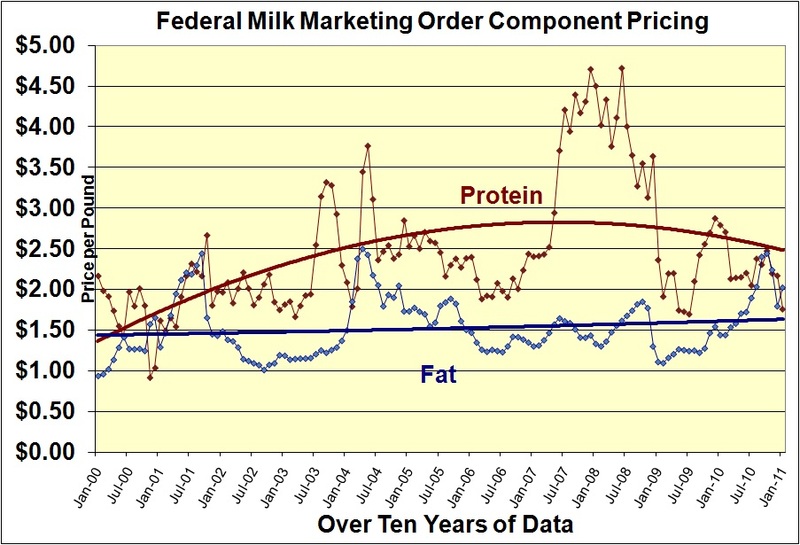 There has recently been notable mention in the press about improving milk prices. Class III futures for February through April have risen to the $17 and $18/cwt levels. The January Class III milk and component prices were released February 4. Class III Milk Prices continued their downward trend at $13.48/cwt compared to $13.83 in December of 2010, $15.44 in November, and $16.94 in October. 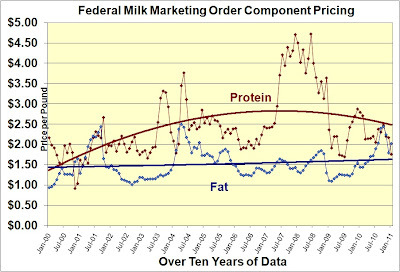 The dashboard of changes were red for cheese prices, Class III milk prices (highly related to the cheese price), and protein prices. 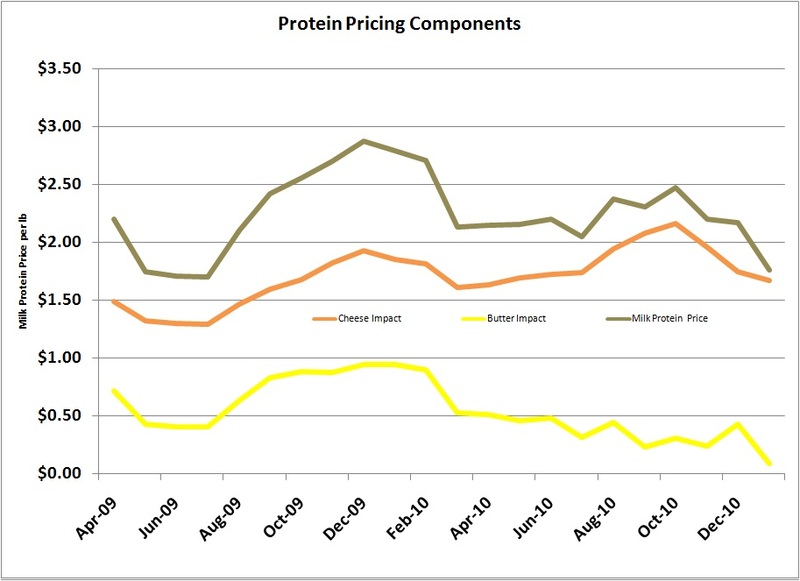 The big decrease in the protein price was primarily the result of the increase in butter and butterfat prices. The details of this relationship were explained in the August 10 post to this blog. 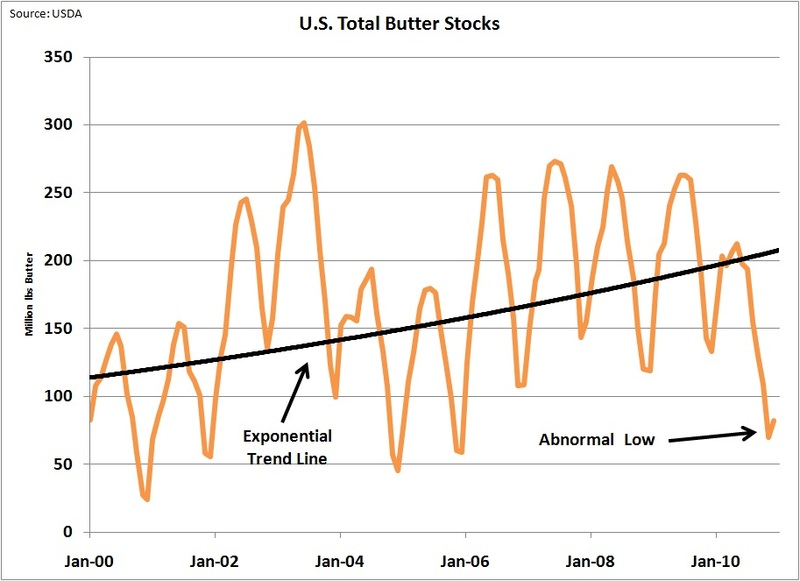 A part of the cheese price is the differential in value for butterfat when it is used in cheese rather than butter. In January, the value of butterfat in butter and cheese were almost equal. The chart below shows this relationship over time. The contribution of butter to the price of cheese was almost zero. 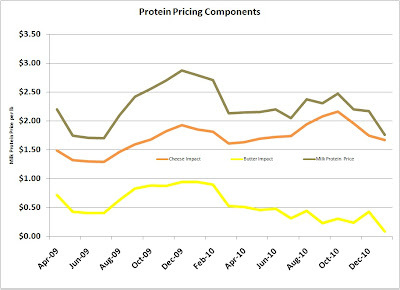 The price of protein in January reached a low not seen since 2001 except for a brief interval in 2009. In one word, "inventories" are behind the current prices. The economic laws of supply and demand are always present. 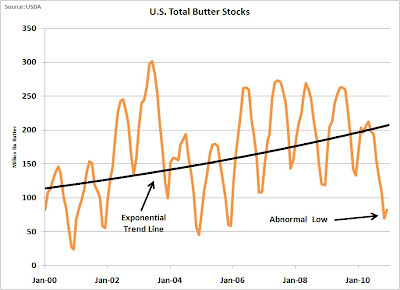 Butter inventories are extremely low and cheese inventories are extremely high. 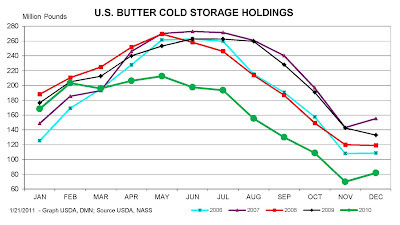 There was an increase in butterfat in November and December of 2010 which allowed an increase in butter churning in January 2011.
and also in the "by year" USDA plot of butter holdings. The year 2010 is in green in the USDA plot. 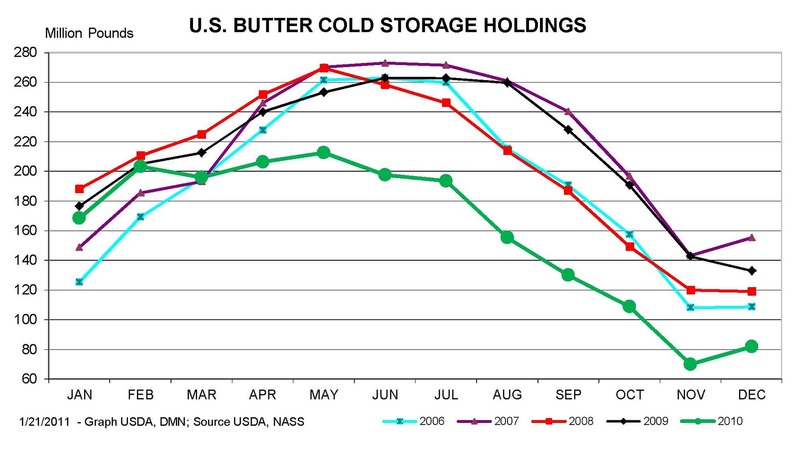 The active programs to expand exports will also impact butter holding in the coming months. A return to "normal" inventory levels is still a long way off. 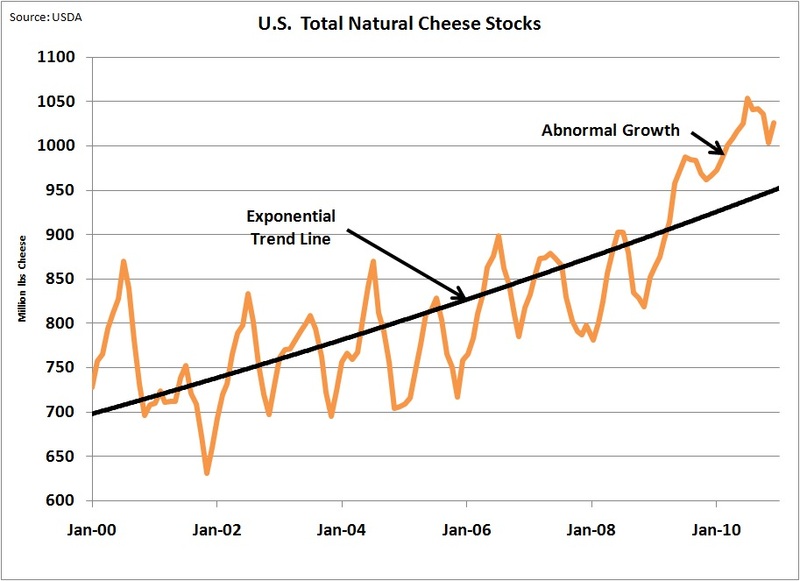 Cheese has the opposite problem. Production and inventories remain very high. 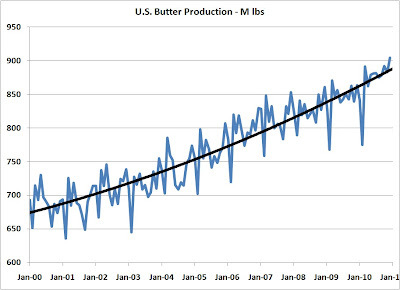 Production has been running steady increases for over a year. and also in the "by year" USDA plots. The year 2010 is again illustrated in green below. Cheese inventories began building in mid 2009 and have now continued for 18 months. The efforts to increase exports are working and this will be covered in a future post to this blog. 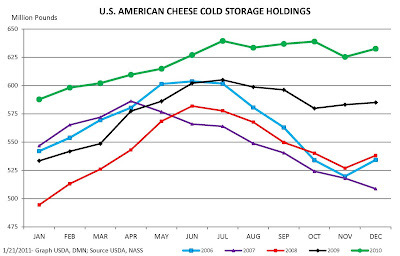 However, just like the low butter stocks, the high cheese inventory levels will take months to restore to "normal " levels and no lasting recovery can occur until these inventories are reduced. The relationship between revenue from butterfat and protein is unusually reversed in January 2011. Typically, most of the milk check comes from protein. 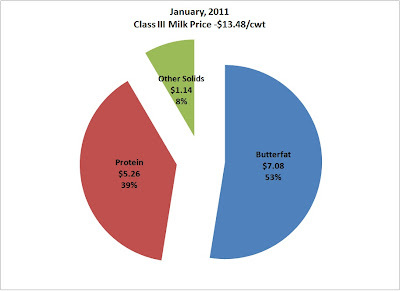 This month we are seeing a pie chart with 53% of the milk check coming from butterfat. ﻿With the January data now available, it brings into question the very high Class III future prices currently available for February through April 2011. 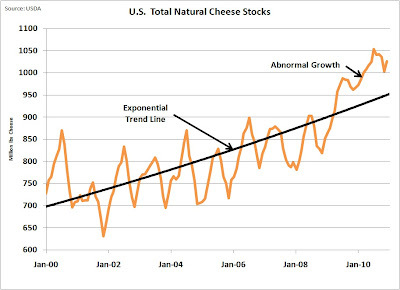 They are supported with higher cheese prices which also are not easily explained. Cash cheese prices on the CME have recently reached in excess of $1.70/lb. 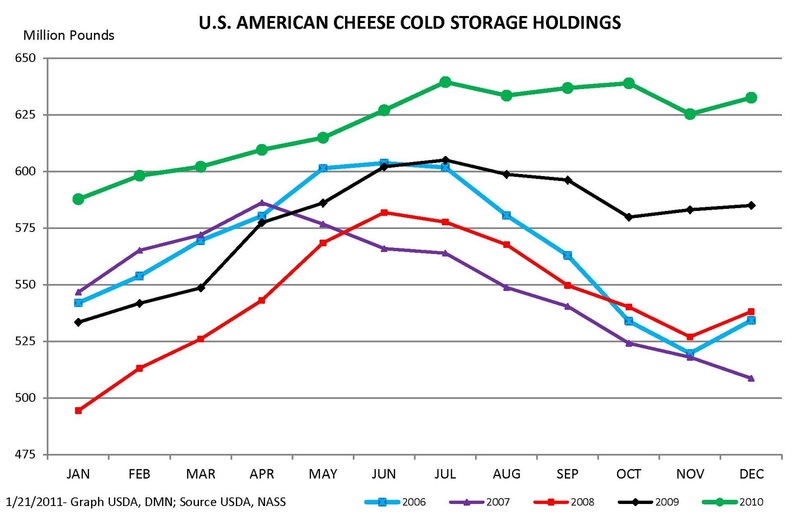 The cheese price that determines cheese pricing is based on NASS prices and the CME prices typically lead the NASS prices by a week. 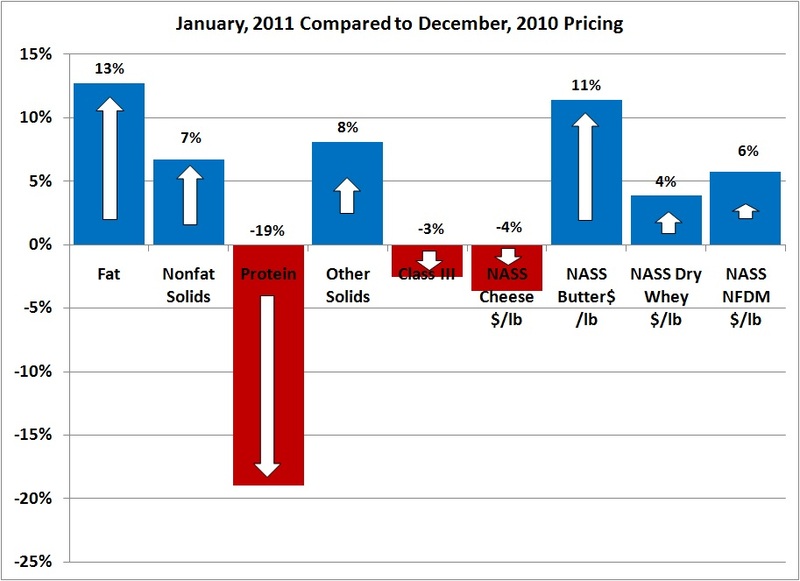 The NASS cheese price for January was $1.41. The NASS prices is typically less volatile than the CME price. Based on a less volatile NASS cheese price and the continued high cheese inventories, it is quite possible that the current high Class III milk futures prices for the next three months will moderate to more rational levels. In 90 days, we all will know.